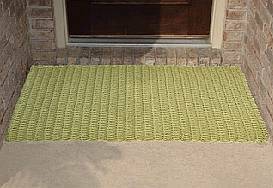 Handcrafted, tightly woven, natural looking 100% Polypropylene Rope Doormats are perfect for porches, patios, verandas, decks, and any busy area. Polypropylene doormats are extremely easy to maintain -- dirt washes away with a water hose or a quick shake. These all weather outdoor mats are perfect for any outdoor area thanks to a water, mold, insect, and mildew resistant construction. Because the doormat is highly resistant to salt water and mildew, it makes an excellent boat or pool mat.